Karol Bagh Hotel Fire: Metropolitan Magistrate Shilpi Jain allowed the custodial interrogation of Rajender Kumar and Vikas Kumar Takkal till February 15. A Delhi court Wednesday sent two men, arrested in connection with a massive fire at Delhi's Karol Bagh area, to two-day police custody. Metropolitan Magistrate Shilpi Jain allowed the custodial interrogation of Rajender Kumar and Vikas Kumar Takkal till February 15. The court directed police to not torture the accused during the remand. "In view of the facts and circumstances and considering that the crucial documents for the purpose of effective investigation are to be collected at the instance of accused persons, two days police custody of accused persons Rajender Kumar and Vikas Kumar Takkal is hereby granted subject to medical examination of the accused after every 24 hours as per Supreme Court guidelines," the court said. 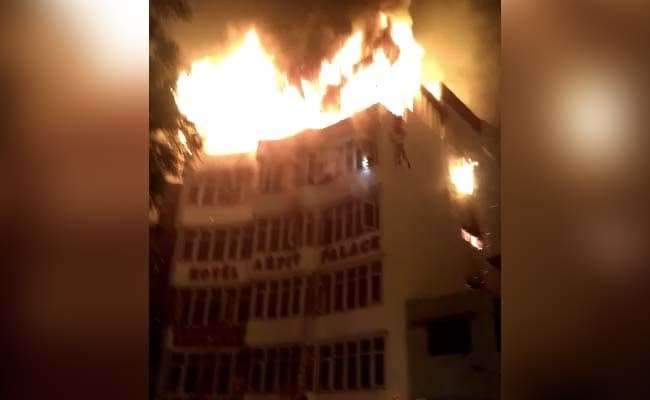 A massive fire covered Arpit Palace Hotel in central Delhi's Karol Bagh area in the early hours of Tuesday, killing 17 people, including two people who jumped off the building in a desperate bid to save themselves. The hotel's general manager, Rajender, and manager, Vikas, were arrested for culpable homicide, police said. The hotel owner, Shardendu Goel, has been on the run since the incident, they said.